Last year I bought the field guide Dragonflies of Texas. Each two-paged species account is packed with information, including a full-sized body silhouette, color photos, range map, key features, and a seasonal histogram, showing what months the species is seen in Texas. Dragonfly seasonality was a new idea to me, and this year I have been paying more attention to which dragonflies I see when. In March and April I see Swamp Darners zooming around the pasture, and Mantled Baskettails perching on tree trunks in the woods. In early summer I see the Slaty Skimmers, Eastern Amberwings, Halloween Pennants, and Blue Dashers everywhere, with a few Common Whitetails and Widow Skimmers. They perch from time to time and then I can get a good picture. In late summer (which we are still having), really huge Black Saddlebags and Common Green Darners appear*, and they drive me crazy because they just never land anywhere. I am very unsure that my real-time identifications are correct. All that information in the guidebook can help me rule out species, (“No, this can’t be an Arroyo Darner because those are only found in West Texas…”) but I have no chance of making a definite ID without a nice still photo to compare to a guidebook photo, and these dragonflies just won’t cooperate. I see them all day long, cruising above the pond and the orchard. I follow them around, repeating, “This is for science!” but they aren’t convinced. As darkness falls, they disappear, and I feel sure they must be perching in the brush by the pond’s edge, or the tall grasses in the wild grass patch, and I hunt for them almost every night, but I don’t find them. The next day, there they are, zooming across the pond again. The other night on one of my searches, I finally found one, very low by the water’s edge in a waterleaf plant. Waterleaf (Hydrolea ovata) is a very ordinary looking plant, about a foot high with thin stems and inch-long leaves. 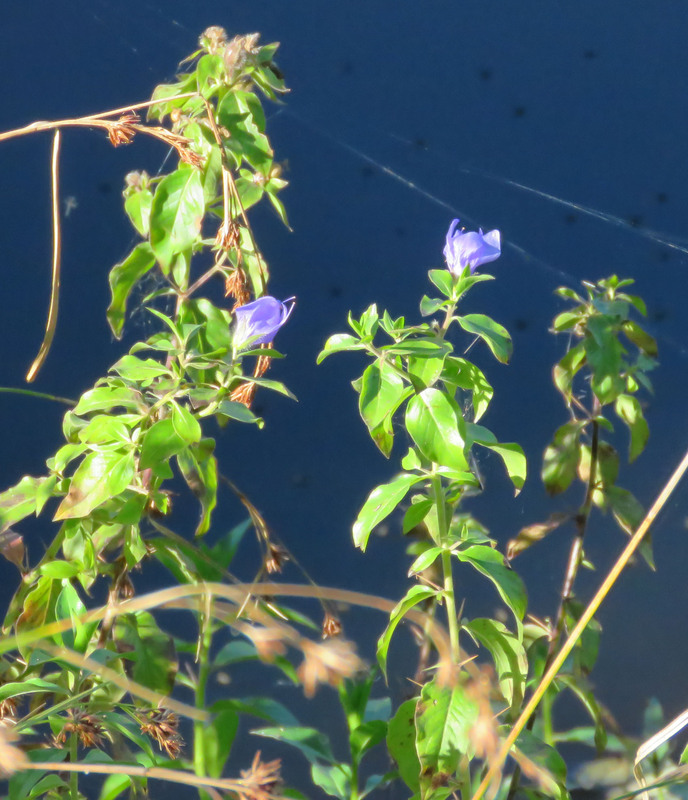 During the summer it has beautiful blue flowers that attract bees and butterflies, but if you try move among the plants to get pictures (or if you are picking them for some gorgeous yellow dye), you soon find out that those stems are covered with thin strong thorns. 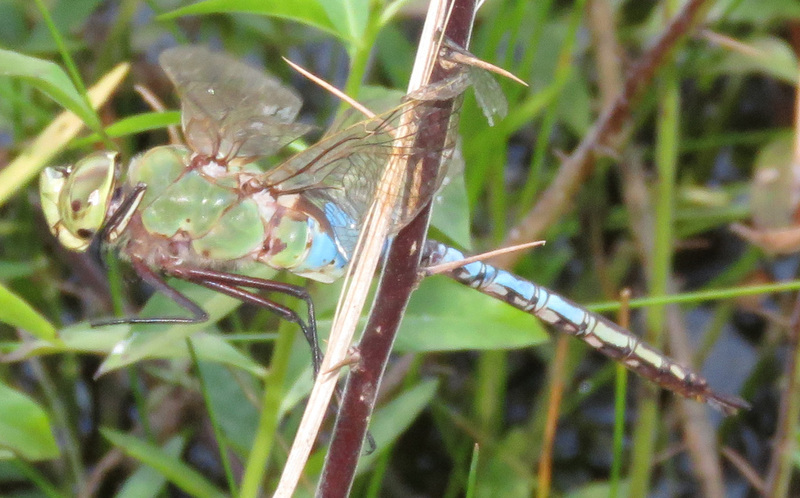 I took a couple of pictures from a distance in case the dragonfly flew off. It kept kind of buzzing in place, then settling down. I began to wonder if it was caught in a spider web. Getting closer, I realized it had caught its wing on a waterleaf thorn, and in trying to get away, it had wrapped itself around the stem like a dog wrapping its leash around a tree. 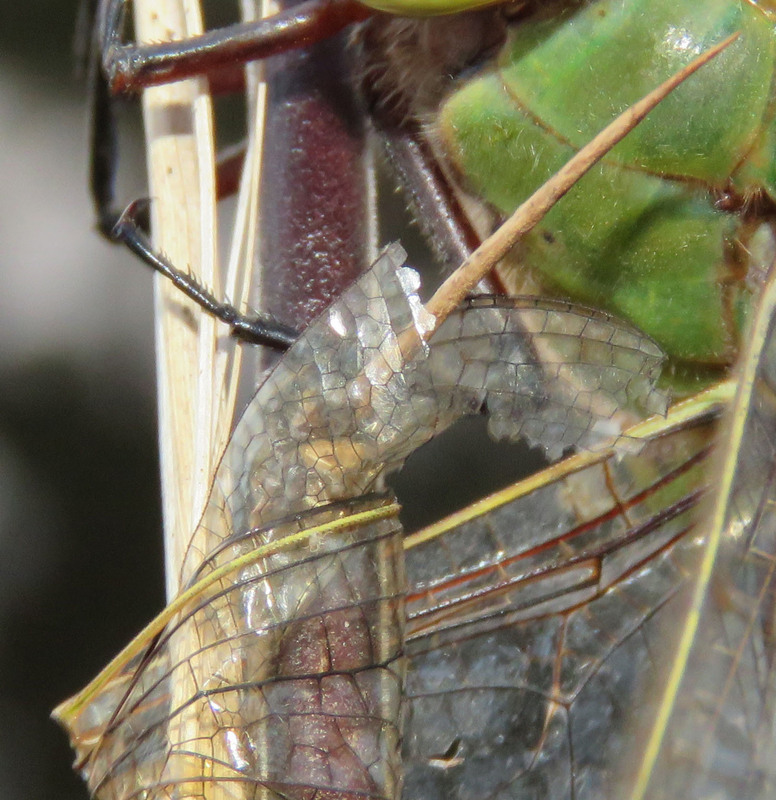 Close-up of the wing wrapped around the thorn. I was amazed at how flexible the veins of the wing were. I had to get to the plant stem without falling in and without scratching my hand on the thorns, and the closer I got, the more the dragonfly struggled, but eventually I got it loose and it flew away. I am sorry it got damaged, but glad that I was finally able to get a good picture. *The guidebook says they are seen year round, but I see them in late summer and fall. Amazing that the wing still worked good enough to fly away. Neat photos! 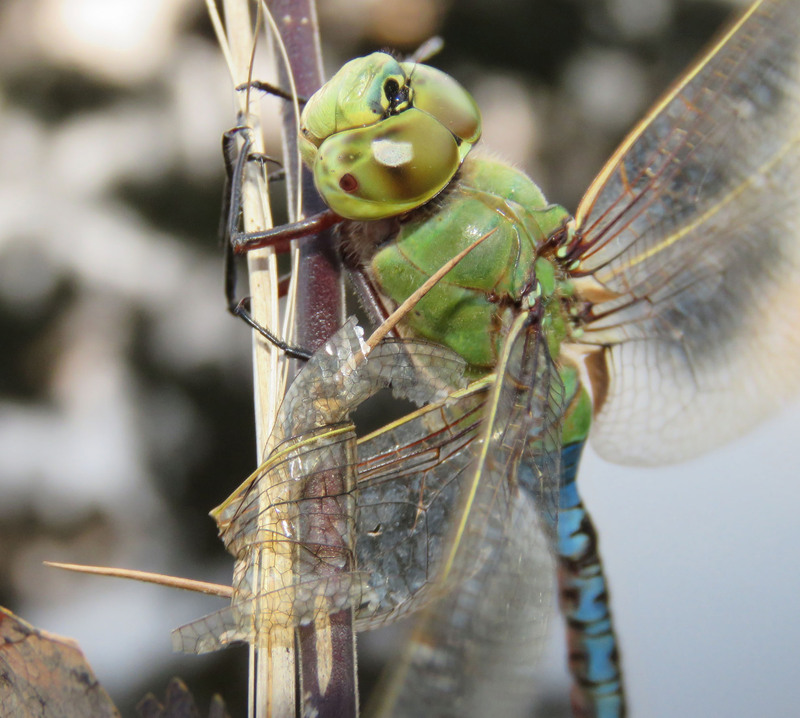 Chasing dragonflies became a great pastime this summer. Good rewarding summer fun. I always brought a smile home. There are probably a few hanging around the ponds embodying a few warm oct. Days yet in NE Ohio. The last shot was quite dramatic. Nasty thorn and tangle. So glad you helped it get loose. I do that, too, even if it’s a wasp caught in a spider web.